MAN! Not having internet is the worst! Since I moved to Kalk Bay, I've had no internet connection. I'm feeling very disconnected from my little world. However, I've been very busy making new stock for shops and selling my products at markets. The Muizenburg market was much fun, I was a little drunk by 11...AM! I felt judged, actually I think I was judging myself. Anyway, I'm doing another market tomorrow at the Earth Fair Market which is in Tokai, we'll be there from around 4pm. 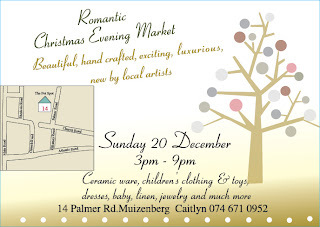 Then on Sunday, I'll be doing a market on 14 Palmer Road, Muizenburg, nice way to end off the weekend, with a glass of champagne, a snack and beautiful handmade gifts for Christmas! I'll be there from 3pm till 9pm. So, I've finally come up with some packaging! My headbands now come in a little packet with a hand drawn paper seal! The brooches now come in little bags with my details. Love the new creations! Let me know if you want to go for a walk, always lookin for walking partners along the k bay/muizies coastline! do the headbands come in other colors?